"A true seaside golf course," says designer P.B. Dye. 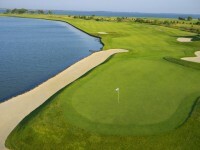 Rum Pointe overlooks Assateague Island National Seashore and the Sinepuxent Bay with no less than seventeen of the eighteen holes having a bay view and several holes having direct bay frontage. From the back tees this championship quality course is capable of hosting a PGA tour stop, but forgiving enough from the middle tees to satisfy golfers of all skill levels. Golfers can even stay on site at the Rum Pointe condo. The large apartment sleeps up to eight people and has magnificent views of the Sinepuxent Bay.